This is the class for nodes presenting build-in functions used in an evaluation trees. Definition at line 43 of file CEvaluationNodeFunction.h. Definition at line 49 of file CEvaluationNodeFunction.h. Definition at line 61 of file CEvaluationNodeFunction.cpp. Definition at line 72 of file CEvaluationNodeFunction.cpp. References ABS, acoth(), acsch(), ARCCOS, ARCCOSH, ARCCOT, arccot(), ARCCOTH, ARCCSC, arccsc(), ARCCSCH, ARCSEC, arcsec(), ARCSECH, ARCSIN, ARCSINH, ARCTAN, ARCTANH, asech(), CEIL, copasiNot(), COS, COSH, COT, cot(), COTH, coth(), CRandom::createGenerator(), CSC, csc(), CSCH, csch(), EXP, FACTORIAL, factorial(), fatalError, FLOOR, LOG, LOG10, MAX, max(), MIN, min(), MINUS, minus(), mpFunction, mpFunction2, mpRandom, CEvaluationNode::mPrecedence, NOT, PLUS, plus(), PRECEDENCE_FUNCTION, RGAMMA, rgamma(), RNORMAL, rnormal(), RPOISSON, rpoisson(), RUNIFORM, runiform(), SEC, sec(), SECH, sech(), SIN, SINH, SQRT, TAN, and TANH. Definition at line 274 of file CEvaluationNodeFunction.cpp. Definition at line 285 of file CEvaluationNodeFunction.cpp. Definition at line 264 of file CEvaluationNodeFunction.h. Definition at line 261 of file CEvaluationNodeFunction.h. Definition at line 255 of file CEvaluationNodeFunction.h. Definition at line 252 of file CEvaluationNodeFunction.h. Definition at line 249 of file CEvaluationNodeFunction.h. Definition at line 258 of file CEvaluationNodeFunction.h. Definition at line 129 of file CEvaluationNodeFunction.h. References CEvaluationNode::getValue(), mpArg1, mpArg2, mpArg3, mpArg4, mpFunction, mpFunction2, mpFunction4, and CEvaluationNode::mValue. Definition at line 287 of file CEvaluationNodeFunction.cpp. References CCopasiNode< std::string >::getChild(), CCopasiNode< _Data >::getSibling(), mpArg1, mpArg2, mpArg3, mpArg4, mpFunction, and mpFunction2. Referenced by getBerkeleyMadonnaString(), getCCodeString(), getDisplayString(), getInfix(), and getXPPString(). Definition at line 293 of file CEvaluationNodeFunction.h. Definition at line 237 of file CEvaluationNodeFunction.h. Definition at line 246 of file CEvaluationNodeFunction.h. Definition at line 234 of file CEvaluationNodeFunction.h. Definition at line 243 of file CEvaluationNodeFunction.h. Definition at line 267 of file CEvaluationNodeFunction.h. Replaces all root nodes with the corresponding power operator since COPASI does not have the ROOT function. Replaces all LOG10 (AST_FUNCTION_LOG) nodes that have two children with the quotient of two LOG10 nodes with the base as the argument for the divisor LOG10 node. Definition at line 767 of file CEvaluationNodeFunction.cpp. References ABS, CCopasiNode< _Data >::addChild(), ARCCOS, ARCCOSH, ARCCOT, ARCCOTH, ARCCSC, ARCCSCH, ARCSEC, ARCSECH, ARCSIN, ARCSINH, ARCTAN, ARCTANH, CEIL, CEvaluationNodeFunction(), COS, COSH, COT, COTH, CSC, CSCH, CEvaluationNodeOperator::DIVIDE, CEvaluationNodeNumber::DOUBLE, EXP, FACTORIAL, fatalError, FLOOR, INVALID, LOG, LOG10, NOT, CEvaluationNodeOperator::POWER, SEC, SECH, SIN, SINH, SQRT, CEvaluationNode::subType(), TAN, TANH, and CEvaluationNode::type(). 791 * operator since COPASI does not have the ROOT function. 811 * as the argument for the divisor LOG10 node. Definition at line 580 of file CEvaluationNodeFunction.cpp. References ABS, ARCCOS, ARCCOSH, ARCCOT, ARCCOTH, ARCCSC, ARCCSCH, ARCSEC, ARCSECH, ARCSIN, ARCSINH, ARCTAN, ARCTANH, CEIL, compile(), COS, COSH, COT, COTH, CSC, CSCH, EXP, FACTORIAL, FLOOR, CEvaluationNode::getType(), LOG, LOG10, MAX, CCopasiNode< std::string >::mData, MIN, MINUS, CEvaluationNode::mType, NOT, PLUS, RGAMMA, RNORMAL, RPOISSON, RUNIFORM, SEC, SECH, SIN, SINH, SQRT, CEvaluationNode::subType(), TAN, and TANH. Definition at line 376 of file CEvaluationNodeFunction.cpp. References ABS, ARCCOS, ARCCOSH, ARCCOT, ARCCOTH, ARCCSC, ARCCSCH, ARCSEC, ARCSECH, ARCSIN, ARCSINH, ARCTAN, ARCTANH, CEIL, compile(), COS, COSH, COT, COTH, CSC, CSCH, EXP, FACTORIAL, FLOOR, CEvaluationNode::getType(), LOG, LOG10, MAX, MIN, MINUS, CEvaluationNode::mType, NOT, PLUS, RGAMMA, RNORMAL, RPOISSON, RUNIFORM, SEC, SECH, SIN, SINH, SQRT, CEvaluationNode::subType(), TAN, and TANH. Definition at line 346 of file CEvaluationNodeFunction.cpp. References compile(), handleNot(), handleSign(), MAX, CCopasiNode< std::string >::mData, MIN, MINUS, CEvaluationNode::mType, NOT, PLUS, RGAMMA, RNORMAL, RPOISSON, and RUNIFORM. Definition at line 316 of file CEvaluationNodeFunction.cpp. Definition at line 1423 of file CEvaluationNodeFunction.cpp. Definition at line 1425 of file CEvaluationNodeFunction.cpp. Definition at line 1431 of file CEvaluationNodeFunction.cpp. References ABS, ARCCOS, ARCCOSH, ARCCOT, ARCCOTH, ARCCSC, ARCCSCH, ARCSEC, ARCSECH, ARCSIN, ARCSINH, ARCTAN, ARCTANH, CEvaluationNode::CALL, CEIL, CEvaluationNode::CONSTANT, COS, COSH, COT, COTH, CSC, CSCH, EXP, FACTORIAL, FLOOR, CCopasiNode< _Data >::getChild(), CCopasiNode< std::string >::getParent(), CEvaluationNode::getType(), INVALID, LOG, LOG10, MAX, CCopasiNode< std::string >::mData, MIN, MINUS, mpArg1, CEvaluationNode::mType, NOT, CEvaluationNode::NUMBER, CEvaluationNode::OPERATOR, PLUS, CEvaluationNodeOperator::POWER, RGAMMA, RNORMAL, RPOISSON, RUNIFORM, SEC, SECH, SIN, SINH, SQRT, TAN, TANH, CEvaluationNode::type(), and CEvaluationNode::VARIABLE. Definition at line 672 of file CEvaluationNodeFunction.cpp. Definition at line 1407 of file CEvaluationNodeFunction.cpp. 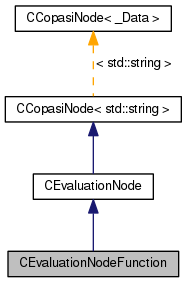 References CEvaluationNode::getType(), CEvaluationNode::LOGICAL, CCopasiNode< std::string >::mData, and mpArg1. Referenced by getDisplayString(), and getInfix(). Definition at line 1384 of file CEvaluationNodeFunction.cpp. References CCopasiNode< std::string >::getParent(), CEvaluationNode::getType(), CCopasiNode< std::string >::mData, mpArg1, CEvaluationNode::OPERATOR, and CEvaluationNodeOperator::POWER. Definition at line 1003 of file CEvaluationNodeFunction.cpp. References CEvaluationNode::mType, NOT, and CEvaluationNode::subType(). Definition at line 50 of file CEvaluationNodeFunction.cpp. Definition at line 56 of file CEvaluationNodeFunction.cpp. Definition at line 287 of file CEvaluationNodeFunction.h. Definition at line 290 of file CEvaluationNodeFunction.h. Definition at line 37 of file CEvaluationNodeFunction.cpp. Definition at line 33 of file CEvaluationNodeFunction.cpp. Definition at line 44 of file CEvaluationNodeFunction.cpp. Definition at line 29 of file CEvaluationNodeFunction.cpp. Definition at line 231 of file CEvaluationNodeFunction.h. Definition at line 240 of file CEvaluationNodeFunction.h. Definition at line 1277 of file CEvaluationNodeFunction.cpp. References CCopasiNode< _Data >::addChild(), CEvaluationNode::copyBranch(), CEvaluationNode::copyNode(), CEvaluationNode::create(), CEvaluationNodeOperator::DIVIDE, CEvaluationNodeNumber::DOUBLE, CEvaluationNode::FUNCTION, MINUS, CEvaluationNode::mType, CEvaluationNode::NUMBER, CEvaluationNode::OPERATOR, CEvaluationNodeOperator::PLUS, CEvaluationNodeOperator::POWER, SQRT, CEvaluationNode::subType(), and CEvaluationNode::type(). 1356 default: //cases VARIABLE, CONSTANT.. Create a new ASTNode corresponding to this FunctionNode. Definition at line 1015 of file CEvaluationNodeFunction.cpp. References ABS, CCopasiNode< _Data >::addChild(), ARCCOS, ARCCOSH, ARCCOT, ARCCOTH, ARCCSC, ARCCSCH, ARCSEC, ARCSECH, ARCSIN, ARCSINH, ARCTAN, ARCTANH, CEIL, COS, COSH, COT, COTH, CSC, CSCH, EXP, FACTORIAL, FLOOR, CCopasiNode< std::string >::getChild(), CCopasiNode< _Data >::getSibling(), CEvaluationNode::getType(), INVALID, LOG, LOG10, MAX, MIN, MINUS, NOT, PLUS, RGAMMA, RNORMAL, RPOISSON, RUNIFORM, SEC, SECH, SIN, SINH, SQRT, CEvaluationNode::subType(), TAN, TANH, and CEvaluationNode::toAST(). 1247 // :TODO: Bug 894: Implement me. Definition at line 325 of file CEvaluationNodeFunction.h. Referenced by calculate(), compile(), getLeft(), getMMLString(), handleNot(), and handleSign(). Definition at line 326 of file CEvaluationNodeFunction.h. Definition at line 327 of file CEvaluationNodeFunction.h. Definition at line 328 of file CEvaluationNodeFunction.h. Definition at line 315 of file CEvaluationNodeFunction.h. Referenced by calculate(), CEvaluationNodeFunction(), and compile(). Definition at line 317 of file CEvaluationNodeFunction.h. Definition at line 320 of file CEvaluationNodeFunction.h. Definition at line 330 of file CEvaluationNodeFunction.h. Referenced by CEvaluationNodeFunction(), rgamma(), rnormal(), rpoisson(), and runiform().